Wash it down with a beer or a margarita ( burp) and forget about getting a diet coke. There is no diet anything here. Their motto is "taste worth dying for". Need I say more? I guess it's all in good fun and I'm sure the owners are laughing all the way to the bank, but it made me stop and think. Is this what the American dream comes down to? We Americans are the fattest people in the world and 47 million of us can't afford health insurance, but we can manage to gorge ourselves on beef and play hospital like it's all a big joke. What are we thinking? Isn't this kind of thing just too pre-global-financial meltdown for words? Watch the video and you'll see what I mean. It's cute, but it made me want to go down to the crunchy granola cafe for a plate of bean sprouts and then spend twenty minutes on the treadmill. "A meal to die for" -- are they very clever (and irreverent) or very stupid (and blind)? Or is it just that they don't care ...? A French TV crew came and filmed at the restaurant awhile ago. I would like to have been a French speaking fly on the wall during that shoot. Mon Dieu!!! These guys certainly hit on a money maker! Now if only there were a "fat tax" on those Quadruple Bypass burgers. don't give the government ideas LOL! oh my gawd. That's terrible. That jiggly burger. Notice they only showed men customers. My husband heard this video from the other room and yelled, "hey, is that the heart attack cafe?" Seriously already knew about it. Fantastic! My husband and I thoroughly enjoyed this post this Sunday Morning. We are so full after watching this. It would make a fantastic hub you know! 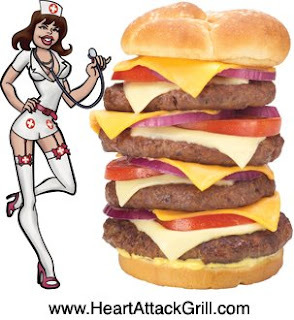 ROTFL-- So when he takes you there are you going to have the double bypass with flatliner fries????? Love this post and really enjoyed the video! I don't know how that guy was able to eat all that!